There are 3 shops proposing this game for download at an average price of $ 6.18. We found the best promotion ongoing with a discount of 75%. There are 2 downloadable contents available for this game. Need for Speed is the most popular car racing game, that most of us had grown with. The Need for Speed is the first game of the series that appeared in 1994. The fact that almost everyone is crazy about speed is well-known, and this game is perfect for those that are passionate about the latest technology when it comes to cars and for the adrenaline enthusiasts. Today I am going to talk about Need for Speed Rivals, my most anticipated racing game of the series. I am telling this because it marks the big arrival of Ferrari, after a long absence, being my favourite ride. Rivals resembles with Hot Pursuit, due to the presence of the exotic cars and high-speed police chases. 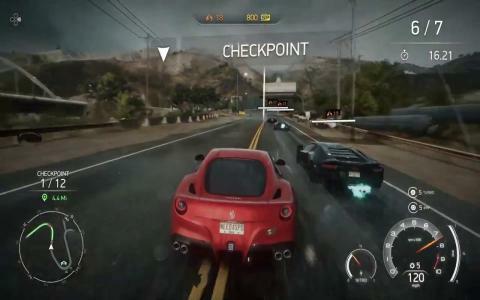 The main action concerns the rivalry between the two well-known sides: illegal racers and police officers. The graphics engine reaches a fantastic level, offering breathtaking and very detailed environment locations, effects and other visual elements. The action takes place in a city named Redview County, and you will have the same skills as found in the HP game. The story is catchy and the characters are not boring or ridiculous at all. The open world environment feature will attract you, for sure! The special soundtrack will make you go crazy and wild on track! There is nothing to hate about this game, so, play it as soon as possible!